PROVIDENCE, R.I. (July 13, 2017) – BankNewport Assistant Vice President/Community Lending Officer, Dariel Blanco recently joined Capital Good Fund representatives for an onsite client financial coaching session. BankNewport extended $7,500 in grants over the past two years to help Capital Good Fund provide its Financial and Health Coaching program (FC Plus) to low-income families in Cranston, Bristol, and Warren, Rhode Island. FC Plus is designed to meet the critical need for financial education and skill building for lower-income families. All FC Plus clients build a budget, develop a debt management and savings plan, review their credit report and credit-building best practices, and identify health issues that may present a financial burden. The FC Plus program consists of four one-on-one coaching sessions over the course of a month, with check-ins at six and twelve months after intake, all of which are conducted by highly-trained Capital Good Fund Financial Coaching Officers and Fellows. FC Plus is comprised of eight modules: goal setting, budgeting, credit, banking, debt, savings, health, and reflection. The BankNewport grants allowed Capital Good Fund to provide the FC Plus program to over 100 families from Cranston, Bristol, and Warren over the past two years. In addition, the Bank grants supported upgrades to Capital Good Fund’s online coaching portal, allowing financial coaches and clients to easily track the clients’ progress and return to the curriculum throughout the year-long program, regardless of geography. A unique feature of the FC Plus program is its credit-building aspect, in that the $180 program fee is treated as a 0% APR loan that the client pays off over 12 months. Capital Good Fund reports these loan payments to the three credit bureaus; clients who consistently make on-time payments will see an average increase of 65 points in their FICO score. Those with no FICO score at intake into the program can expect a score of 650 by the end of the year-long program. Capital Good Fund, a nonprofit, US Treasury-certified Community Development Financial Institution based in Providence, provides equitable financial services that create pathways out of poverty for families in need. 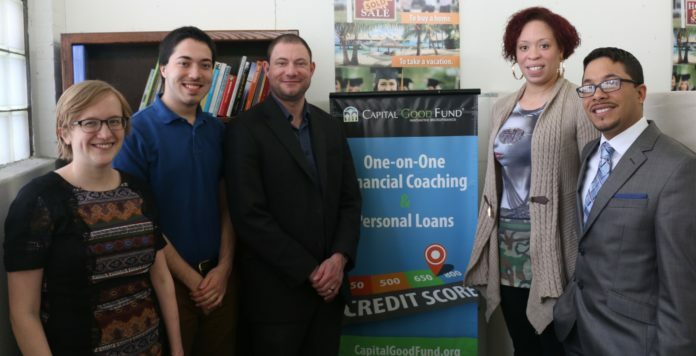 Since its founding in 2009, Capital Good Fund has financed 1,779 small-dollar personal loans totaling $2.4 million in and graduated over 1,100 families through the Financial and Health Coaching program. Using financial empowerment, Capital Good Fund meets the needs of their clients, fosters social mobility and works to eliminate the wealth and opportunity gaps within our society. Previous article6 arrested in R.I. as part of $1.3B health care fraud case across U.S.